The UN human rights office has urged Egypt to free the daughter of an Islamic scholar and her husband who have been held without a formal charge since June 30. Ola al-Qaradawi is the daughter of Yusuf al-Qaradawi, a leading Islamic scholar, who lives in exile in Qatar. 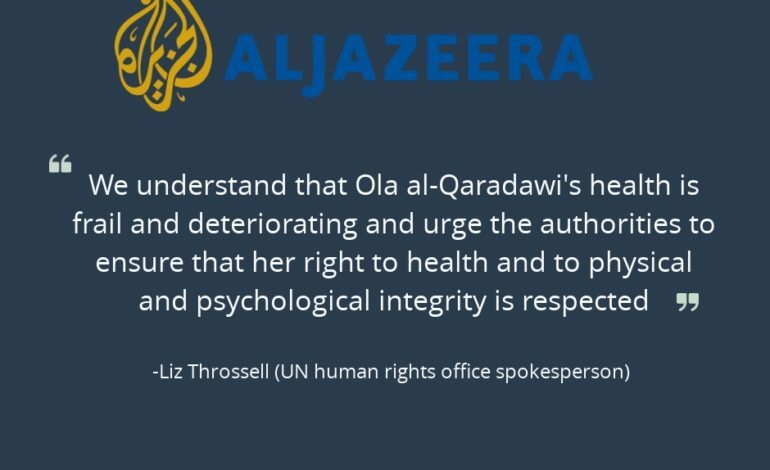 “We understand that Ola al-Qaradawi’s health is frail and deteriorating and urge the authorities to ensure that her right to health and to physical and psychological integrity is respected,” Liz Throssell, spokesperson for the UN human rights office, told journalists in Geneva on Tuesday. Ola al-Qaradawi has been held in solitary confinement “in one of the worst prisons in Egypt”, the UN human rights office said on Tuesday. Her husband, Hosam Khalaf, is being held in similar conditions in a different prison, according to media reports. “We call on Egypt to release all those arbitrarily detained in the country unconditionally,” the office said. In June, a UN-mandated body issued a decision determining that Qaradawi and her husband had been arbitrarily arrested, and called for their immediate release. Qaradawi’s prolonged solitary confinement could also amount to torture, cruel, inhuman or degrading treatment, the office said. The Cairo government claims that Ola al-Qaradawi and Hosam Khalaf were accused of belonging to the banned Muslim Brotherhood, which it says is a “terrorist” group. The family denies the accusation and last September brought the case to the UN working group on arbitrary detention. Egyptian authorities have arrested thousands of political opponents to President Abdel Fattah al-Sisi since he led the 2013 overthrow of former President Mohamed Morsi, who was a member of the Brotherhood. Critics say it is the worst political crackdown in Egypt’s modern history.